This message is sent to all members of Democrats Abroad Switzerland. Please forward this message to other Americans living here and encourage them to join DA Switzerland! On Friday October 21st DA Zurich chapter elected two very motivated and talented women to serve as their Chair and Secretary/Treasurer. Please welcome Renee Rousseau, Zurich Chapter Chair and Ashley Wheeler, Zurich Chapter Secretary/Treasurer. Ashley also serves on DA Switzerland's Executive Committee as Secretary. We are looking forward to working with all of you and continuing the great group vibe we has under the fantastic leadership of Jennifer Giroux. We all know that it is going to take all of our energy and involvement to re-elect President Obama and Vice President Biden back into office; and return the majority vote in the House and Senate once again to our party. This election is too important to sit back and watch from the sidelines! It is going to take everyone to lead our party to victory in 2012! We have lots of events planned for the coming months, including events to watch and discuss the republican presidential debates, a Mock Debate with "Switzerland for Ron Paul" supporters, potluck evenings and showing interesting political documentaries and enjoy interesting discussion to follow. We also hope to welcome some US political movers and shakers as special guests to our group for Q&A evenings. We'll be sending out event invitations and announcements soon, so watch your inbox! The 2008 election cycle was extremely eventful and interesting. We hope 2012 will be as well. If you would like to volunteer for hosting, fundraising or any other duties please feel free to contact us by email. We KNOW you are all FIRED UP AND READY TO GO IN 2012!! We're a vivacious bunch that will be getting together regularly with other followers of American politics to talk, share ideas and to make sure we're participating fully in the political process. We're not just Democrats and are open to everyone, American or not. This Friday, November 25th, we'll be kicking things off with a Whiskey tasting organized at a member's home. For more details please email Ammad at vice-chair@democrats.ch or follow our Facebook page. 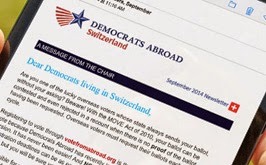 As we head into 2012 election year, Democrats Abroad is urgently seeking keen campaigners who can help us secure thousands of critical votes from Americans right here in the Switzerland. One of our must important roles here is to find and register US voters - if you can help, please join us for the first voter registration and volunteer training call and get trained to be a voter registrar and find out ways to volunteer to help the campaign. Please RSVP to: chair@democrats.ch if you can join the call (teleconference). Location: Your phone. RSVP by Dec. 3rd and we will send you a teleconference invitation to dial in from a local Swiss phone or via Skype. Can't make it but want to get involved? Let us know and we'll plan future trainings to better fit your schedule! On behalf of Democrats Abroad Switzerland, we wish you all a very Happy Thanksgiving!